Laser Safety goes under the ANSI 136.1 standard in the United States and the EN207/EN208/EC60825 standards in Europe, Australia and New Zealand. Lasers are categorised by the ANSI Z136.1 standard into the following categories. NOTE: The category alone is not enough to work out which eye protection is required. 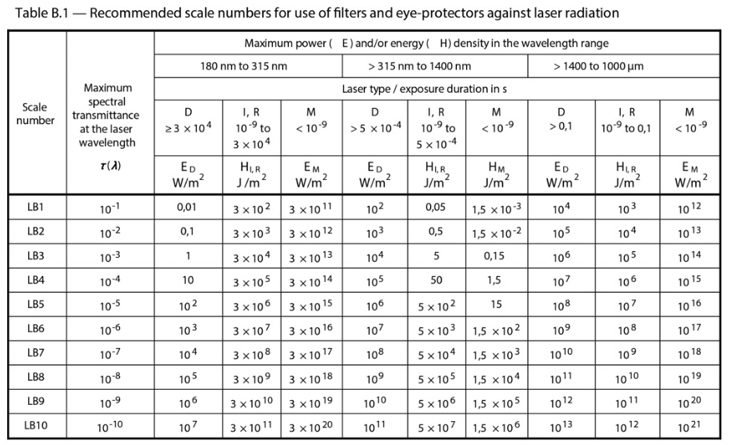 Australian, NZ and European laser safety regulations EN 207/EN208 consider Optical Density and also the power/energy density (power over time over area) of the laser when determining laser safety requirements. Like ANSI Z136.1, laser safety eyewear must provide sufficient optical density to reduce the power of a laser to be equal or less than the Maximum Permissible Exposure levels (MPE), but it must also provide damage threshold protection (direct hit over a given amount of time/energy). Under EN207, Laser safety goggles must protect against direct intrabeam exposure to the laser.